Eight-year old Cormac Friedlander is like a lot of boys his age—full of energy and obsessed with soccer. So when his mother, Jennifer, noticed him on the sidelines during recess, she couldn’t help but wonder why. Cormac, who was born with cerebral palsy, explained to her that he had trouble getting the ball and competing with his friends. While his mother’s first instinct was to encourage him to continue playing, she understood the challenges of a condition that can affect body movement and muscle coordination. “It is sometimes easy to forget the limitations of his body and how that impacts his ability to participate in sports with more typically developing kids,” Jennifer explains. Soon after that day, Cormac and Jennifer searched for a soccer team in the area for children with special needs. When they couldn’t find one, Cormac insisted on doing whatever it took to bring one to the city. A few months later, the Chicago Super Stars held its first practice. For leading this remarkable charge, Cormac has been selected as one of ten Guaranteed Impact winners. What began with Cormac’s seemingly simple suggestion of starting a team picked up steam when he continued to push his mother throughout the winter until she too was ready to act. From that point on, Cormac worked tirelessly to make the team a reality, from collaborating with a friend to come up with the team’s name and working with a designer on the team’s logo to finding a sponsor for the jerseys. In April, the team’s first practice was held and it was a success. 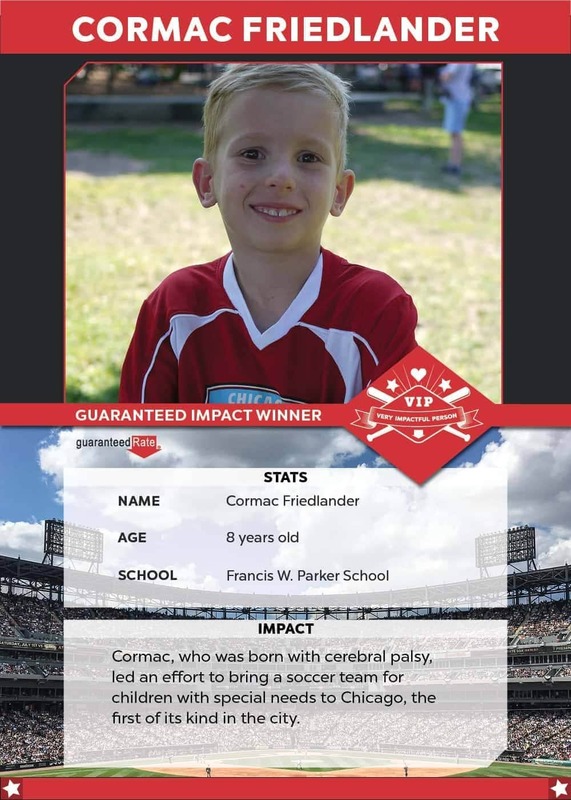 Now, Cormac and his new teammates can gather regularly to do something they love—play soccer.